Upper Big Branch Miners get Don Blankenship’s prayers. 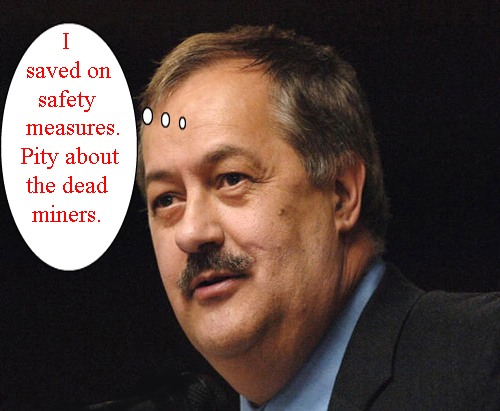 And his criminal neglect of safety measures at the mine. The miners have to sacrifice their lives for their livelihood. Nationwide, an average of 2 percent of safety violations are unwarrantable failures. Slightly more than 10 percent of Upper Big Branch mine's violations last year were unwarrantable failures. The Upper Big Branch mine is owned by Massey Energy, a Virginia-based firm that faced a then-record .5 million fine after a fire at its Aracoma Coal Mine in Logan County, W.Va., in which two men became lost amid a wash of smoke because of missing safety walls. At the time of Monday's explosion, Upper Big Branch mine was facing more than 0,000 in fines for pending safety violations, after routine scheduled inspections resulted in more than 100 citations three times in a 12-month period. Since July 2008, seven regularly scheduled safety inspections -- inspections planned ahead of time and not the surprise or "spot" inspections also carried out by federal inspectors -- turned up 614 safety violations, according to records of the federal Mine Safety and Health Administration. As recently as March, the company had been cited for inadequate escapeway plans for its miners and accumulations of coal dust. In January, the mine amassed nearly 0,000 in proposed fines from MSHA after safety inspectors cited them for failure to maintain adequate air ventilation or escape route maps, allowing too much coal dust to accumulate and failure to provide adequate and clearly marked escape routes in the event of emergencies. "It's just a combination of stuff that had to catch up with them sometime," said Minness Justice, who was the inspector at Massey's Aracoma mine in the months before a fire there killed two workers. Mr. Justice, who left MSHA after a bitter dispute in which the agency sought to discipline him over the Aracoma incident, pointed to a March 2009 citation and proposed ,000 fine for an unwarrantable failure in its ventilation system. The ventilation system in a mine is crucial to removing dust and methane and providing a continuous flow of fresh air to the working face. He said in the first quarter of 2010, the mine was cited 25 times for ventilation violations but 21 of them were listed as "not serious and substantial," meaning they resulted in nominal fines. "Inspectors have written it and written it and written it, but they didn't write it with any authority," Mr. Justice said.